I built a Q2 from the Quickie Corp. from 1981 - 1985. I built it in an unheated warehouse owned by M.I.T. about 3 miles from where I was living in Somerville, Ma. I (and everyone else in there) got kicked out just before they tore the warehouse down, so I moved the plane to an airport (in Beverly, MA) 25 miles from my house, finally got it finished, and started the taxi testing. It was named FIDO, and was white (big surprise for a glass plane) with a brown bottom and wingtips with red accent stripes. You can't see the colors much in these pictures. We took all these photos at Beverly Airport. You can see my $80 special VW fastback in some of them. Nothing like a car with two trunks to haul tools around. The plane was very nice and I got a lot of compliments, although I'm realistic enough to know that I would never have won any awards. So, back to taxi testing. Due to a combination of the C.G. being about 2-3 inches too far forward, the brakes pulling a bit to the right, instructions from the tower not to cross the runway intersection, and not least of all my own impatience and stupidity in the face of these known facts, I nosed the plane over after running off the pavement into the grass and broke the prop. Being a glider pilot and having landed both power and gliders on grass all the time, I figured grass was O.K. and it never occurred to me that the grass next to a paved strip wasn't quite as smooth as that which served as the primary runway. I didn't touch the thing for about a year, then I fixed it up, moved the battery rearward, balanced the brakes, put on a new prop, but was never able to start the engine again. Here I am putting on the new prop (I think). By that time, we had a young child and two houses, the plane was 30 miles from where I lived, and I gave up and sold it, esentially for nothing. Well, not nothing - $2500, but a lot less than the $14,000 I had in it at the time. Oh, well; live and learn. Amazingly enough, I kept ABSOLUTELY no record of the bloody thing; no logbook, no parts, nothing, except the 6 pictures I've scanned in to show here. As many of you know, in the dim, dark past I built another airplane. 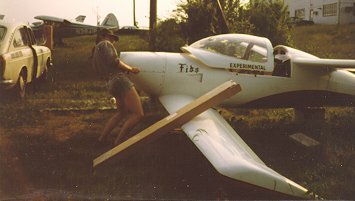 In 1981, I saw an picture on the cover of Popular Science for a kitplane called a Quickie Q2, and being single, living in a room for $200/mo. and just being out of college, I was flush with some money burning a hole in my wallet. I purchased the Q2 kit and spent the next four years and 2200 hours building a plane that they said would take 500 hours to build. I worked completely alone, on the mezzanine level of an almost empty warehouse owned by M.I.T. and used by the M.I.T. soaring club, who let me have some space. I had no support structure such as this, I made no calls to the factory that I can remember, and I got about 20 hours worth of help from friends total. 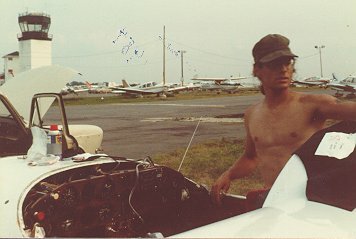 In 1984 I brought the plane to Beverly airport (north of Boston) and finished working on it in a tiedown spot next to the Revere Aviation hangar. The A&P's there let me borrow lots of tools, and gave me advice. When the plane was done (or as done as these things ever get, I guess), I started taxi testing it. Due to extreme brain freeze while experiencing a couple of small mechanical problems (brakes pulling to the right, ineffective tailwheel steering at higher speeds), I ran off the runway into the grass and went up on the nose, breaking the prop. I worked on it on and off for another few months, but I had just moved in with my (now) wife and we were renovating a house. I couldn't get the engine (of the plane, not the house [or the wife, for that matter]) started, and I eventually lost interest/time. A child, another house, and even less time, and the plane just sat. 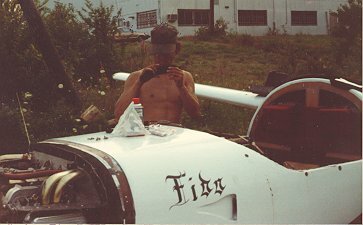 Seven years or so later (1992), I sold the plane to a guy named Mark Kettering (he's a Grumman flyer now), who sold it a year later to a guy named Ed McLeod who lives here in MA. Monday, I got an email from Ed saying that he saw my web page and that he's still got the airplane. I went to visit him and the plane yesterday at lunchtime - it turns out his shop is about 10 miles from my house and 15 minutes from where I work. The plane has been partially repainted, the tailwheel has been replaced, and some of the interior/panel redone, but 95% of it is my work. I remembered all the little things, and was even able to tell him where I buried the wires for the strobes in the wingtips. He had told me in the email that he was planning to fly it in the spring, so I was excited that it was eventually going to make it into the air. I had been working under the assumption that it had never flown, but when I got there, Ed told me that his lunatic partner had actually flown the thing twice last year, without asking Ed about it first! So, I'm just totally psyched that I've actually built a plane that has flown and hasn't killed anyone!!! I think that I knew intellectually that it COULD fly, and that it was structurally sound, but the actual FACT of it having flown is something that I did not expect to create the emotions in me that it has. It makes me feel better about the COZY building - that I now KNOW that this one will work as well. I'm very motivated to continue working on the COZY even after 5 years of effort - the home stretch is ahead, and I'm getting my second wind.